With the popularity of electric skateboards, and the seemingly thousands of them that have stormed the market in the past few years, there’s bound to be some eSk8s and brands that are a little “shady”; things you should be wary of. Let’s look at three boards that you should definitely stay clear of. The Hellfire supposedly reaches 20mph and can travel up to 20 miles. Good luck trying to figure out whether that’s true or not. On Amazon.com, the ratio of good to bad stars is 6:4. This means for every two bad comments, there is a good comment. That is not good. Others said that the rubber wheels cracked, truck bolts stripped, and the electronics came loose. One reviewer reported giving the eSk8 the benefit of the doubt, despite reading the flurry of bad reviews, and regretting the decision. On paper, the Big Daddy seems like an amazing board. Maple deck, aluminum wheel rims, can carry 300 lbs., 800 W motor reaches 22mph, and has the coveted anti-lock regenerative braking system. Aside from FiiK’s cheesy marketing (“Oh yeah, BIG DADDY’S got the world doing a double take!”), this board seems like it’s worth buying. Until you read the reviews on Amazon. Then you find out that not only is FiiK’s customer service unresponsive and unhelpful, but one reviewer stated that he/she rode the board for less than an hour… before it died. Now it won’t run more than 2 minutes before dying again. Let’s talk about the size of this thing. It is massive. A lot of people complain about the aesthetics of the Big Daddy – which is indeed big. As if that weren’t enough, for all of these “wonderful” features… the Big Daddy lives up to its name by weighing a staggering 50+lbs. If you don’t like looking at massive trucks and enormous off-road wheels (which seem too big for the board itself), the Big Daddy is a no-go for you. Not only that: the battery actually sticks out from underneath the deck. To be fair to FiiK, they didn’t make this board to be sleek or look appealing – on that mark they hit the nail on the head. However, I truly hope they didn’t design this board to run for less than an hour before dying – that is inexcusable. Right off the bat, in the Q&A section of Amazon.com at least four of the five answerers suggested the questioneers NOT to buy this product. If that isn’t the real life equivalency of a “Abandon All Hope” sign outside a haunted house, I don’t know what is. There are 28 reviews from this product, and only 16 of those are positive. A lot of people complain that the motor stopped working after a short while. On the other hand, those who have a good experience (who seem to be parents that bought it for their sons) with this eSk8 cannot express enough joy over it. This is truly one of the lowest-priced boards I’ve ever seen. Personally, I equate “low cost” with “cheaply-made” in some cases. Investments such as an electric transportation vehicle are one of those cases. It’s no surprise that a lot of $350-500 boards belong to some of the biggest names in this industry. Let’s take a look “under the hood” (figuratively speaking) at what this particular eSk8 has to offer. It weighs a total of 11.5lbs, which is admirably light. When the battery (which is not a lithium-ion, which could explain the low sale price) is fully depleted, it can be recharged in 2 hours. The top distance you can travel is 13 miles and low-to-medium speed. Top speeds are ~15mph, which as always depends on rider weight and riding speed. 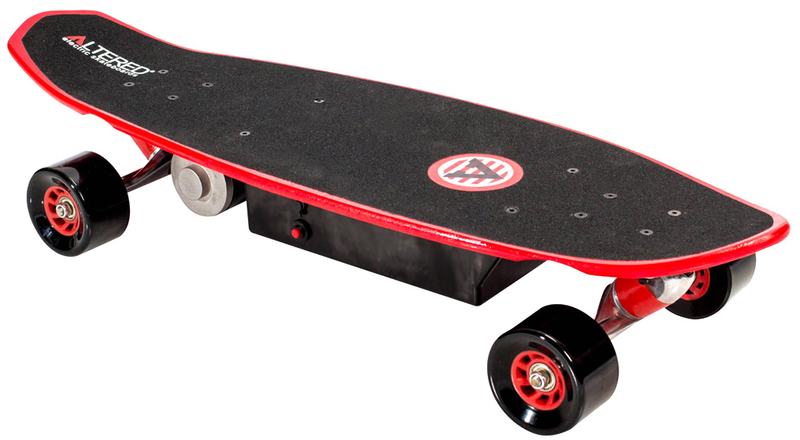 The board supports up to 200 lbs., which is significantly lower than the average weight electric skateboards carry. One common theme you saw here is that these three boards seem to perform well on paper. It isn’t until quite a few unlucky customers actually tried these boards out for themselves that they discovered… the eSk8s just weren’t worth the money or the hassle of getting in contact with lousy customer services. If you were considering buying one of the electric skateboards listed here, I hope you reconsidered and will think about investing your hard-earned money in quality skateboards. If you’re nervous about the high price tags of brand-name eSk8s, there are quite a few “unpopular” but high-quality eSk8s out there that you might like.